Review: Emerald Wasabi Peanuts | Verdict: Nay, Horseradish! Today I shall review Emerald Oven Roasted Wasabi Peanuts. Once again, they were purchased on sale, with a coupon.. making the normally expensive nuts a mere 40 cents for a container of them. With such fancy packaging and clever advertisement campaigns, I was thinking these would be the best darn peanuts ever. Having only had wasabi a couple of times, I was surprised when the flavor was so very familiar. After mulling it over, I realized it was not wasabi I was tasting, it was horseradish! ..which is something I'm quite familiar with, as my father has proudly grown and grated his own horseradish for years. A quick check of the ingredients confirmed this, horseradish was listed as the fourth ingredient, right after peanuts, corn syrup, and sugar. Wasabi, however, was the very last on the long list.. past all the green food coloring. 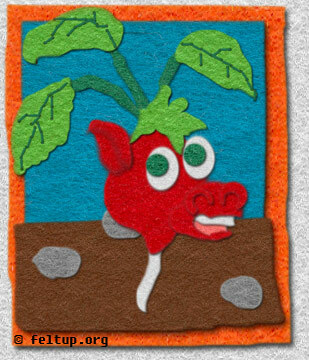 Even though the root of the horseradish looks nothing like a horse or a radish, I thought it would be fun to pretend it does. The peanuts claim to have a "bold" flavor, however they only have a mild zest from the horseradish, and not even a hint of wasabi. Not like my dad's freshly grated horseradish, that stuff will unclog your sinuses with a single whiff. Needless to say, I was disappointed. I haven't really eaten many spicy foods since I discovered that a lot of them cause me to break out in hideous face rashes, and this claim of "bold" really got my hopes up. I know that wasabi is known as Japanese horseradish and the two are closely related, however it still seemed like a wrongful substitution. So if you buy these, just know that they are just green food coloring, horseradish, and not very wasabi. I will probably only buy them again if they cost less than 40 cents.